It's Friday, and that means it's Bloggers Challenge day! It's also garbage day here, and I'm sure you wonder why in the heck is she telling me that! Well....I'm not sure about you, but I keep an "art rag" under my desk. What's an art rag you ask? It's the rag I use to wipe off my stamps when I'm cleaning them. I use it to wipe up the overspray off my desk when using spray mists, it's full of many different colors from many projects. Well, tonight DH decided he was going to throw it away with the garbage and gave me a clean one.....ACKKKKK I could just see my mojo leaving me for the night, and that it did! What should have taken me 10 minutes took me way too long! I had given the BC members this inspiration piece last month, so I've had it in the back of my mind for awhile. I knew I wanted to use the damask as my inspiration, it just took some time to figure out a sketch that would work with what I wanted to do. Here's the final outcome using the inspiration piece and the sketch. The long rust panel was embossed using the Damask Texturz Plate. The Damask image from Friends 24-7 was stamped using the Faux Dry Emboss Technique. The sentiment comes from the JustRite Emotions Self Inking Stamps, and their a steal at just ONE DOLLAR for the entire set of 8 stamps! The words are great to use alone, or as a grouping like I've used here on my card. Looking to be inspired? Check out the other players blogs to see what inspired them this week. Want to play along? Just leave link to your post here on my blog, or if uploading to SCS, use keyword BC86, so I can find your card. Have a great Friday, thanks for stopping by! What a fantastic card, Lisa!!!! This is super gorgeous! Love the faux dry emboss and the charm is a perfect finish! Your MOJO left? I don't think so!! This is just lovely! 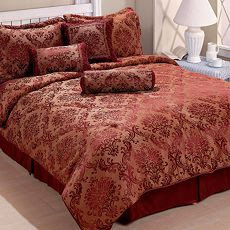 Simple, elegant, and captures the feel of that fabulous bedroom ensemble. Lisa, you've done it again!! Very nice card, Lisa! Love the little silver butterfly that just pops right off the card giving it LIFE! Wow, Lisa! this is STUNNING! This is you mojo-less?! No need to worry then...because you are talented with or without mojo! Why do you keep your mojo on a dirty rag anyhow?! LOL! OMG!!! This is just awesome!! 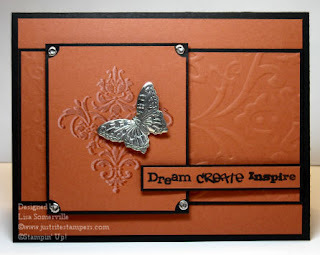 And that faux dry embossing is just awesome too!! Will have to give that a try! I think your tricking us about the mojo thing! Great card, such clean lines. Art rag or not, that is just gorgeous. This is soooo beautiful. That butterfly is amazing!! Love this! Gorgeous card Lisa, I love the embossing and the faux dry emboss (I haven't mastered that technique)is fabulous. Oh and your sketch is great (I'm saving that one for future use). Great card, I love the textures. The butterfly is perfect!! LOVE your card...it almost has a look of suede! OOOhhh love the embossing texture and goes so well with the Faux Embossing technique..
Art rag? You don't need no stinking "art rag"! This is gorgeous, Lisa! Wow!!! What a gorgeous card! I love the faux dry emboss! 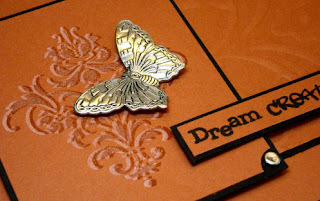 The faux dry embossing is perfect for the damask stamp. Stunning! Well, for having your mojo leave, this is one beautiful project! !